Phat Diem is located 120km south of Hanoi and 30km south-east of Ninh Binh. 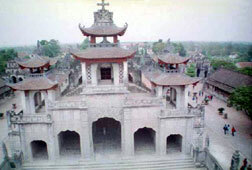 It's main point of interest is a large cathedral with unusual Sino-Vietnamese architecture. The ceiling is supprted by huge 1 metre diameter wooden columns and there is a solid granite alter plus a number of wood and stone carvings. The cathedrals highest tower sports a huge bell, at the base of the tower are two huge stone slabs which apparently were used by the Mandarins as a means to observe the catholic mass. The easiest route is by motorcycle or car from Ninh Binh. You may also be able to combine a trip to Phat Diem with a custom tour of Ninh Binh or one of the nearby national parks.